The raw food diet is based on consuming unprocessed, preferably organic, whole plant-based foods, at least 75 per cent of which should be uncooked. This diet gives you a high amount of energy as raw food is easily metabolized. People who follow the raw diet use particular techniques to prepare foods. These include sprouting seeds, grains and beans; soaking nuts and dried fruits; and juicing fruits and vegetables. The only cooking that is acceptable is by using a dehydrator. A dehydrator blows hot air through the food but never reaches a temperature higher than 116°F. Raw food diet advocates believe that cooked foods take longer to digest and allow partially digested fats, proteins and carbohydrates to clog up our digestive system and arteries. Cooking also destroys the enzymes contained in food. 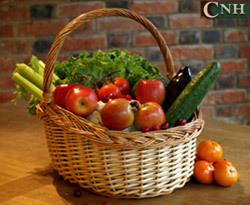 At the College of Natural Health, we teach the benefits of eating raw foods as a superior form of nutrition. We offer many holistic natural health courses that will teach you about the raw food diet, vegetarian diet, vegan diet and acid alkaline balance diet. We believe that proper nutrition is crucial to good health, considering the toxic environment we live in today. It is imperative to eat foods that will provide clean sources of fuel. Whole, organic, seasonal foods offer significant nutrients not found in foods that have been processed or denatured. Knowing what to eat and what not to eat is becoming more important every day, as we continue to live in a stressful, toxic world.